Le Creuset Cast Iron Oval Ovens is the original slow cooker. Its enameled coating helps it heat evenly and keep that heat longer. The oval shaped is specially designed for turkeys, chickens or roasts. 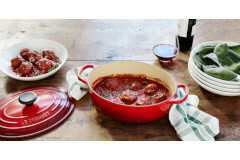 Le Creuset oval ovens can withstand temperatures of up to 500 degrees and are dishwasher safe.